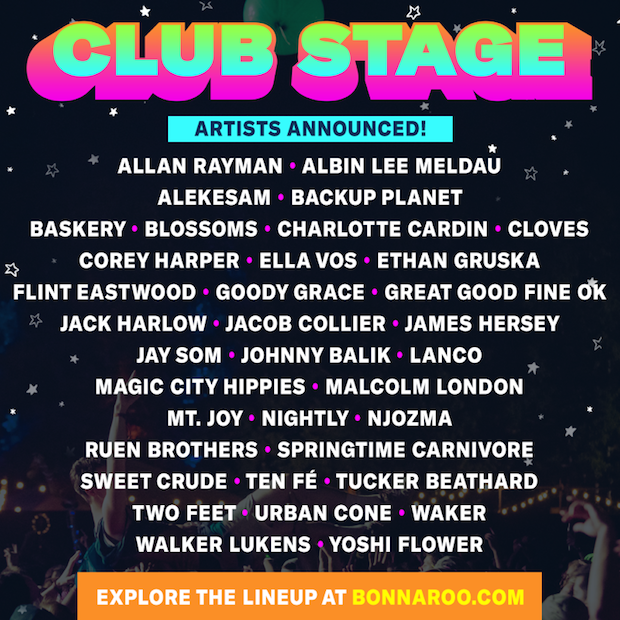 Following a main stage lineup announcement, a comedy slate, daily lineups, and even the introduction of a “new” stage, Bonnaroo is inching closer, and that means it’s time for the full lineup to be rounded out with the addition of this year’s Club Stage bands. For the uninitiated, the Club Stages (the New Music on Tap Lounge and the Who Stage) are where the festival’s tiniest acts perform, and are a great way to get up and close and personal with the best rising talent. In the past, they’ve frequently included performers who’ve gone on to play much larger slots, sometimes even just the next year, and have historically included some of our favorite and most interesting Bonnaroo moments. This year’s Club Stage slate features some familiar names (per usual, several locals), and plenty of acts we’re looking forward to getting acquainted with, including Allan Rayman, Alekesam, Albin Lee Meldau, Backup Planet, Baskery, Blossoms, Charlotte Cardin, Cloves, Corey Harper, Ella Vos, Ethan Gruska, Flint Eastwood, Goody Grace, Great Good Fine Ok, Jack Harlow, Jacob Collier, James Hersey, Jay Som, Johnny Balik, LANCO, Malcolm London, Magic City Hippies, Mt. Joy, Nightly, Njozma, Ruen Brothers, Springtime Carnivore, Sweet Crude, Ten Fé, Tucker Beathard, Two Feet, Urban Cone, Waker, Walker Lukens, and Yoshi Flower. We’ll bring you some artist previews in the coming months to help you get acquainted, so be sure to snag tickets while they’re still available right here, because Bonnaroo’s 16th season will be here before you know it, June 8-11 in Manchester.